Have Fun and Get in Shape! Pole dancing is a fantastic way to get fit, lose weight and get rid of those wobbly bits! We assure you that we will do our best to put you at ease and make your lessons most enjoyable. 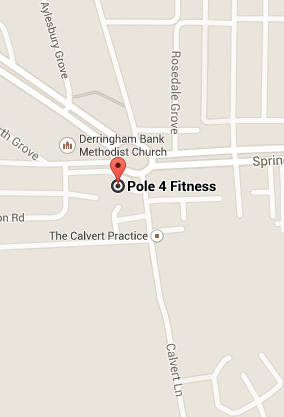 Welcome to the Pole 4 Fitness website! Pole 4 fitness can support weight loss, define your muscles, increase your flexibility and mobility, and improve posture and co-ordination as well as improve mood, self-esteem and body image. Your class will be fun but challenging. We will teach you how to perform moves that to others look impossible to do. The dynamic work out will also give you the added health benefits of increase bone mass and decrease bone loss (depending on your age) an increase in metabolism and reduced fat storage. It will allow you to progressively work at your own pace taking into account your unique body shape, strengths and weaknesses. In each lesson you will make small improvements until one day you realise you are not the same person that started. The more you push though each set of moves the more confident you will get to reach the next stage. You soon realise that you are capable of more than you ever thought possible as your inner strength grows. You will discover the impact a group of like-minded people can have on you as you support and encourage each other. This group are not your competition but are your ‘comrades in action’ as you support the weakest and follow the strongest. Our ‘gangs’ #wannabeinourgang are what keep you coming, safety in numbers, not letting the team down and not getting left behind whilst allowing you to progress at your own pace. People worry that we are going to ask you to work beyond your capabilities and in fact one of the most common things we hear is ‘I’ll join when I’m fitter, thinner, stronger etc’ as they see the gravity deifying tricks and think ‘I’ll never do that!’ But we start your journey with your feet firmly on the ground and as you feel you can we will help you to swing, spin, climb, invert, flip, slide, drop, roll and dance! Everyone who trains at Pole 4 Fitness will have the opportunity to perform in shows, demonstrations, events and competitions. As part of your training we will be every step of the way with you giving you all the necessary skills to show the world what you are capable of. Still not convinced? Why not try before you buy and attend one of our taster sessions?